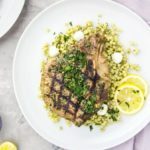 These Gremolata Garlic & Herb Pork Chops can be ready, from prep to finish, in 30 minutes or less! 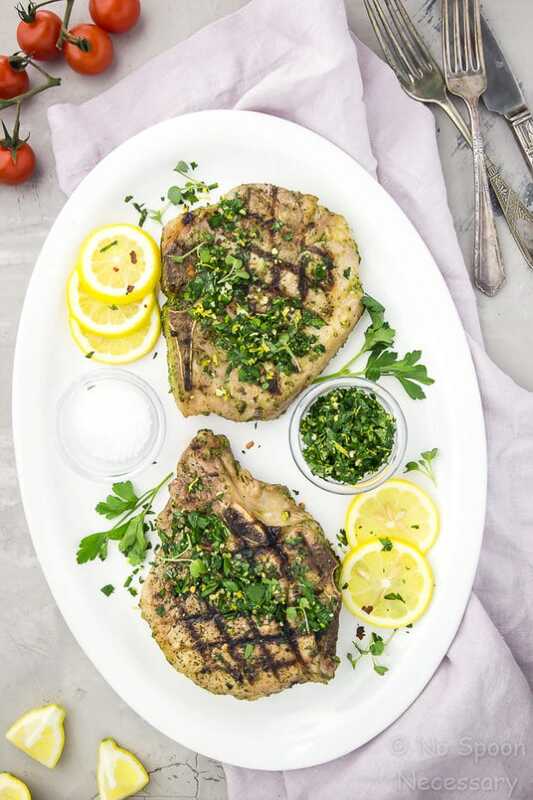 Infused with pungent garlic and fresh herbs, and topped with easy, herbaceous gremolata, these chops are fast to prepare, but packed full of flavor! This shop has been compensated by Collective Bias, Inc. and its advertiser. All opinions are mine alone. #AllNaturalPork #CollectiveBias Thank you for supporting the brands that make No Spoon Necessary possible! I hope it was wonderful, and you ate entirely too much food… and drank way too many festive cocktails (as if that could ever be a thing). And, I hope you aren’t feeling those pesky post-holiday blues today! Ick. Question – have you ever been so stressed out that you feel like your brain is hemorrhaging BASIC information? Well, that is me at this current moment in time. And, by basic I mean, common words, proper grammar, how to form a sentence… basically, command of the English language. Shoot, I’m even having a hard time remembering account passwords and the year I was born. Wait. What was I saying?! It’s pretty fair to say right now that I am NOT smarter than a fifth grader. Oh, and DON’T even get me started on meal planning and making dinner EVERY night of the week when I’m stressed. Ugh, THAT becomes the bane of my existence. Well, that is where Smithfield All Natural Bone-In Pork Chops come into play. They are simple, yet scrumptious. Their price tag won’t break the bank, AND preparing them won’t boggle your mind. PLUS, they have NO added steroids, hormones, or artificial junk. 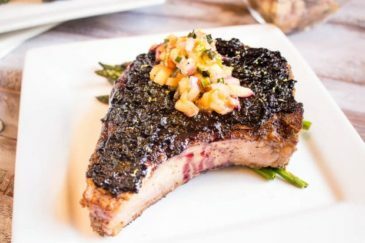 Basically, Smithfield’s commitment to quality and their naturally tender pork chops are saving my sanity, one delicious dinner at a time. You should get in your car, run to Walmart, pick up some Smithfield All Natural Fresh Pork and save your sanity too. Otherwise known as palatial pork chops. BONE-IN because I want ALL the flava. 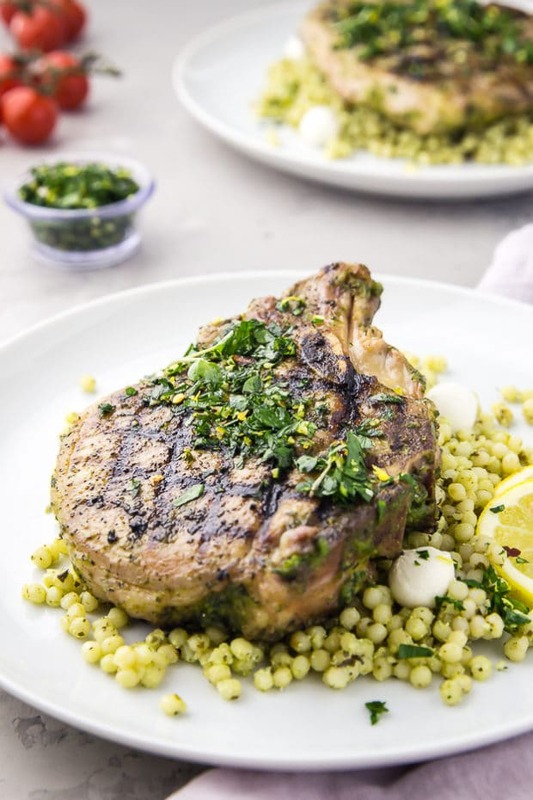 Juicy, savory, succulent pork chops infused with pungent garlic, fresh herbs and smoke from the grill; then generously topped with bright, herbaceous, zesty gremolata. Like I said, these chops have ALL THE FLAVA! And, on top of these pork chops being downright deeeelish, they are also a BREEZE to throw together. I’m talking 30 minutes or less, from prep to finish, type of breeze. *In case any of you are wondering what side I served these chops with, I’m sharing the recipe on Thursday! So make sure you come back and pay me a visit. Mmmmm’kay? 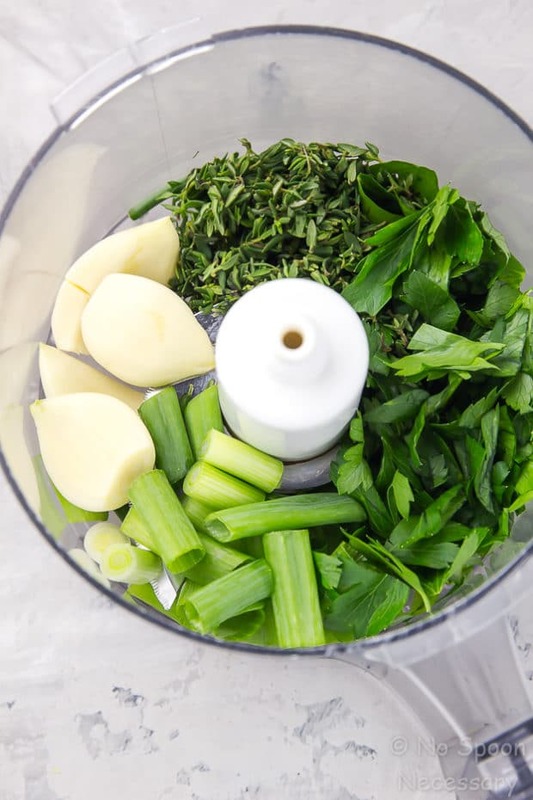 First, you will make the marinade for the pork chops by blitzing together some fresh herbs with garlic in a food processor. When everything is roughly chopped, slowly stream in a few tablespoons of oil while the motor is running. Let the processor do its thing until the mixture is smooth. Transfer the pork chops to a shallow baking dish and pour the marinade on top, turning the chops to coat. 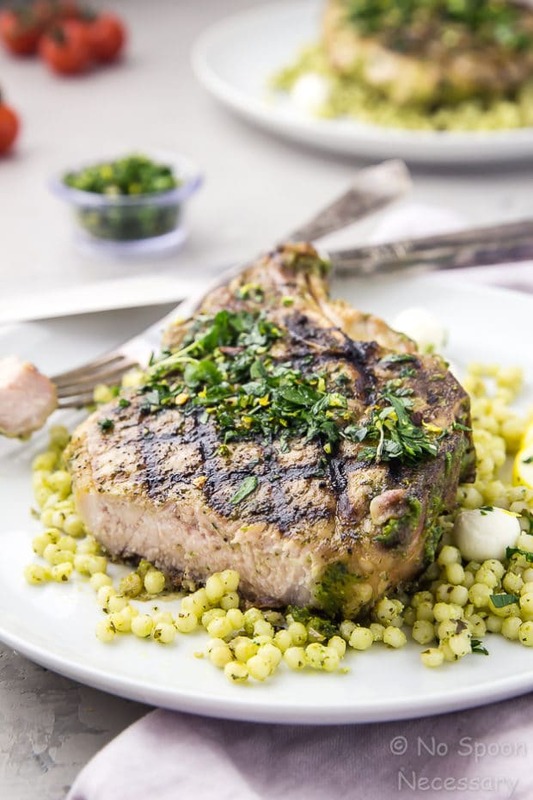 Let the pork chops hang out in the marinade while you prepare the super simple gremolata. In a small bowl mix together minced garlic, coarsely chopped parsley and the zest of a lemon. Stir in a pinch of crushed red pepper flakes and season to taste with salt and pepper. When the chops are done marinating, preheat your grill, or grill pan. Remove the pork chops from the marinade and season them generously with salt and pepper on both sides. Grill them to your desired doneness and let them rest for a few minutes. Top ‘em with the gremolata and serve. The garlic and herb marinade should be thick, and almost paste like. You can marinate the pork chops for as little as 30 minutes, or up to 8 hours. For the most flavor, I recommend letting your pork chops marinate at least 4 hours, just make sure you turn the pork chops occasionally to evenly distribute the marinade. If you are marinating the chops for over 30 minutes, you will need to refrigerate them. Be sure you remove the pork chops from the fridge 30 minutes BEFORE grilling so they can come to room temperature. Make sure you use a pastry brush or spoon to remove, and discard, the excess marinade before grilling to prevent burning. The grill time in the recipe below is approximate. It will depend on the thickness of your pork chops, and your desired level of doneness. I recommend using an instant read thermometer if you aren’t sure. If you like your pork medium rare, you should cook it to an internal temperature of 145 degrees F (followed by a 3 minute rest). If you like your pork a little more well-done, cook it to an internal temperature of 160 degrees. 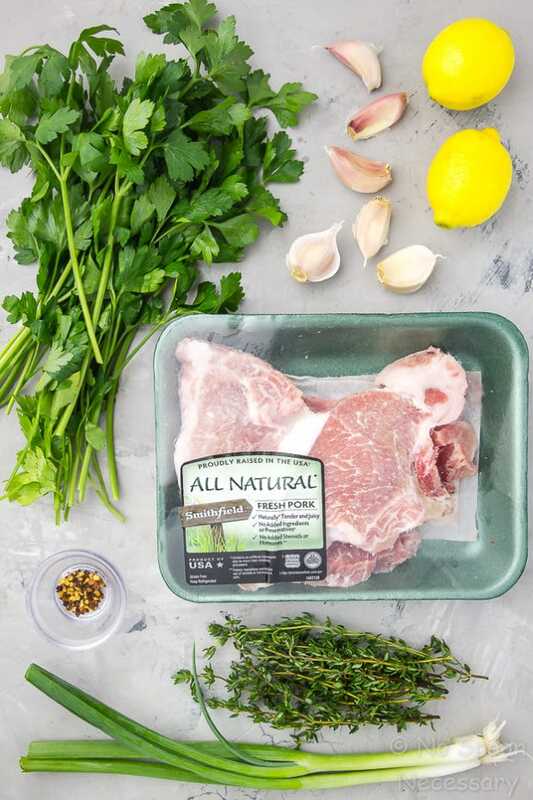 Fast and flavorful, these Gremolata Garlic & Herb Pork Chops NEED to be a part of your spring and summer dinner rotation. So fire up the grill, friends! Until Thursday friends, cheers – to gettin’ yo’ grill on. 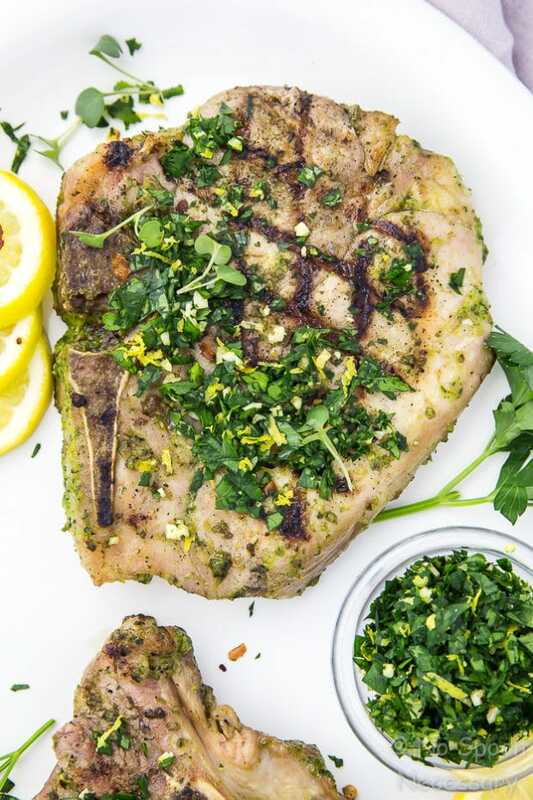 These Garlic & Herb Pork Chops can be ready, from prep to finish, in 30 minutes or less! 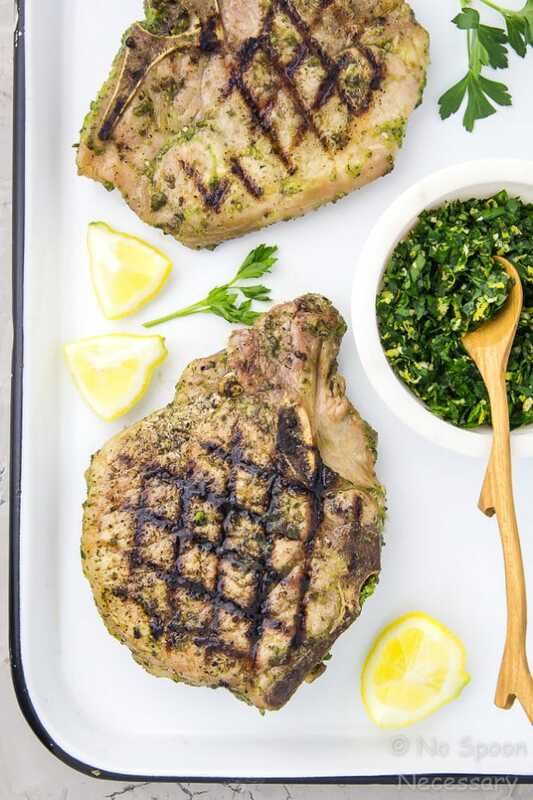 Infused with pungent garlic and fresh herbs, and topped with easy, herbaceous gremolata, these chops are fast to prepare, but packed full of flavor! 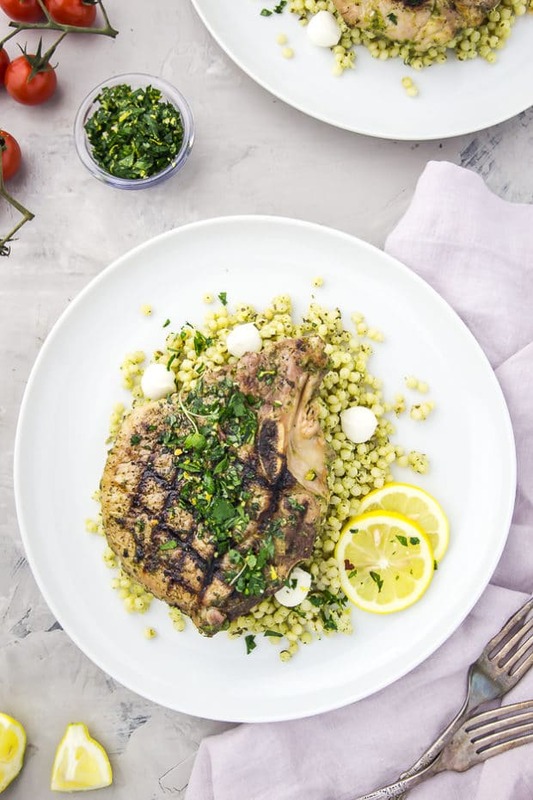 Make the Marinade for the Pork Chops: In the bowl of a food processor combine the garlic, scallions, parsley, thyme, lemon zest, ½ teaspoon salt and ¼ teaspoon pepper. Process until roughly chopped, stopping to scrape down sides as necessary. With the motor running, stream in the oil and continue to process until mixture is smooth. Marinate the Pork Chops*: Transfer the pork chops to shallow baking dish or Ziploc bag and pour the marinade over the chops turning to coat. Cover and let the chops marinate at room temperature, turning at occasionally, for at least 30 minutes. Or, transfer the chops to the refrigerator and let marinate for up to 4 hours, turning occasionally. If refrigerating, make sure you let the pork chops come to room temperature for 30 minutes before cooking. Meanwhile, Make the Gremolata: In a small bowl mix together all the ingredients for the gremolata. Set aside until ready to use. Cook the Pork Chops: Preheat an outdoor grill OR an indoor grill pan to medium-high (Between 350-375F). Remove the pork chops from the marinade and use a brush, or spoon, to remove excess marinade and discard*. Season generously with salt and pepper. 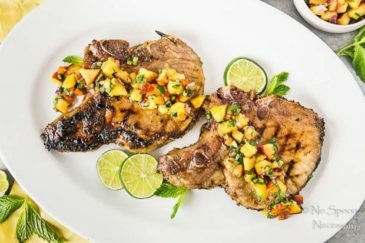 Place the pork chops directly on the grill and cook, turning once, for about 4-5 minutes per side for medium, or until desired doneness is achieved*. Remove from grill and let rest 3 minutes. 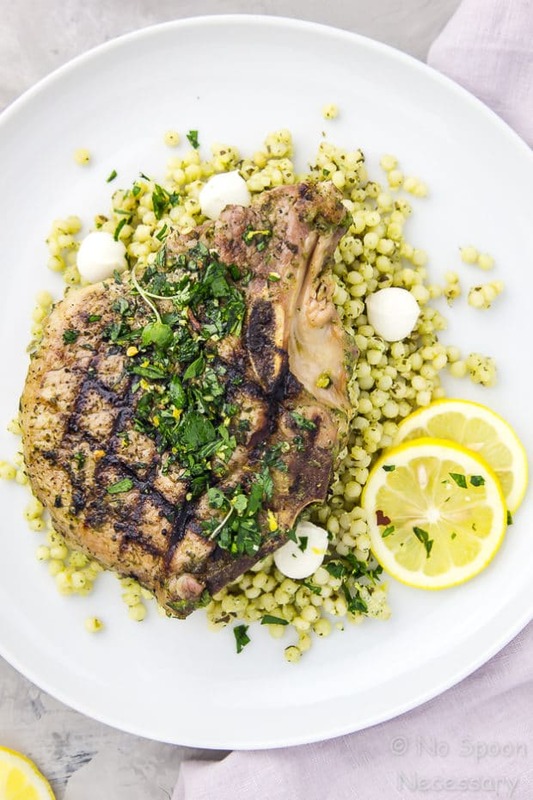 To Serve: Transfer pork chops to plates and top generously with gremolata. Enjoy! 1. The garlic and herb marinade should be thick, and almost paste like. You can marinate the pork chops for as little as 30 minutes, or up to 8 hours. For the most flavor, I recommend letting your pork chops marinate at least 4 hours, just make sure you turn the pork chops occasionally to evenly distribute the marinade. If you are marinating the chops for over 30 minutes, you will need to refrigerate them. Be sure you remove the pork chops from the fridge 30 minutes BEFORE grilling so they can come to room temperature. 2. Make sure you use a pastry brush or spoon to remove, and discard, the excess marinade before grilling to prevent burning. 3. The grill time in the recipe is approximate. It will depend on the thickness of your pork chops, and your desired level of doneness. I recommend using an instant read thermometer if you aren’t sure. If you like your pork medium rare, you should cook it to an internal temperature of 145 degrees F (followed by a 3 minute rest). If you like your pork a little more well-done, cook it to an internal temperature of 160 degrees. Looking good here my dear! Catching up on my favorite bloggers yumminess while on vaca is only happening because everyone went to sleep early on me! The gremolata is perfect with this one. Hope things have lightened up since our last phone call. Cheers! I am sorry. I hit a breaking point right before the weekend of my triathlon. We lost a dear friend, we bought a house, my youngest caught a nasty cold, and I was about to go into a rainy triathlon in 38F degree weather. Feeling better these days, and wow, does it feel quite different. I hope the air clears for you soon. Pork and I have never been friends, but…but…you are giving me hope that I can do it with your gorgeous recipe! Hang in there with all the busy-ness – I feel ya! First, these pork chops sound amazing! So fresh with that topping!!! Second, lemme know if you need anything!!! I feel like finally things are calming down here with all the construction (last contractor finishing up!! yay!) and it’s transferred to you with all the craziness! I could just eat gremolata with a spoon! There was one restaurant that served it with bread, and it was so fantastic but I think people, including us, ate too much of it and they ended up closing! But boy it was such a great combo. 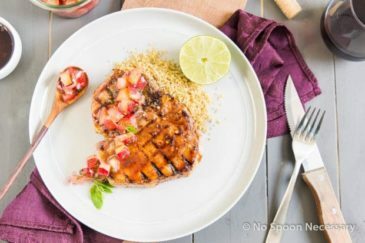 On pork chops – yes indeedy! We haven’t had pork chops in ages… never once this year. Your pictures make me crave them, I should put some chops on my shopping list. And about remembering passwords, I have a two-page long list full of them, the only ones I know by heart are my email and the Amazon account. These pork chops look perfectly cooked! you are regurgitating those thoughts I forgot I was thinking! This question “have you ever been so stressed out that you feel like your brain is hemorrhaging BASIC information?” is me currently – as for passwords I had to write them down, as for my age – I have to count forwards any time anyone asks me what it is – bugger! I have two more weeks of juggling classes and work and helping my daughter with college stuff! Now that Lent is over and am back on a meat diet – Smithfield is currently hanging out in my fridge too so I cannot wait to try this out! 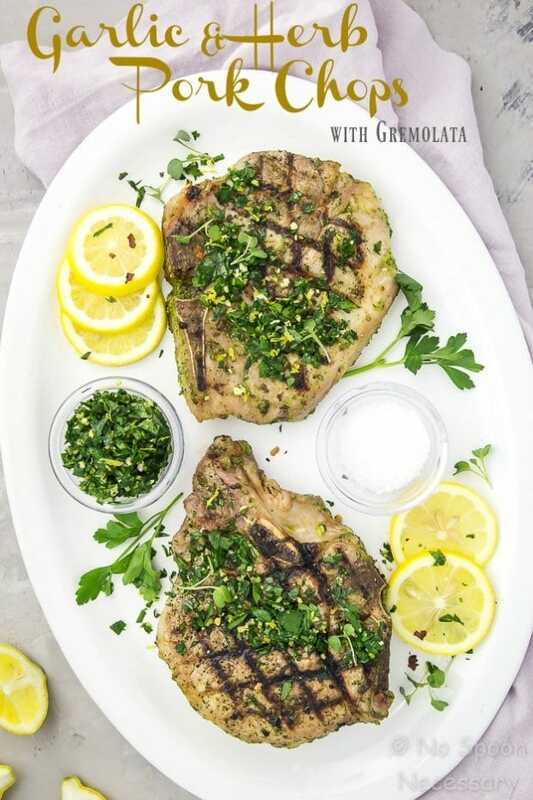 I’ve never made my own Gremolata – such a quick and tasty addition to SF already juicy and flavorful pork chops! Happy Tuesday to ya – whatever has you stressed, hope it passes and you find peace again soon, my friend. Oh, I know what are you talking about Chey. I feel this way every now and then. Especially by the end of a day. And always on Mondays. Totally loosing the ability to speak/wright/think coherently. But our Easter weekend was quite lovely and filled with some delicious food. And what a coincidence! Just a couple days ago I made one dish with a gremolata. 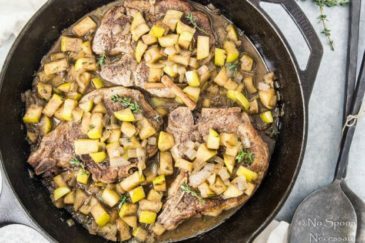 These pork chops, garlicky and herbaceous look succulent and highly delicious – well done!